2 chambres, 2 salle de bains, 4 à 8. Il est temps de se détendre dans la cour arrière en profitant du soleil de l'Arizona ou nager dans votre magnifique piscine (non chauffée). Plan d'étage ouvert avec cuisine en acier inoxydable et le granit. Deux chambres à coucher avec un lit king et un lit queen, un bureau avec un futon (full size) et un canapé-lit dans le salon offre beaucoup d'options de couchage. Beaucoup de lumière naturelle et une grande pour se divertir. Internet wifi, télévision par satellite, barbecue au gaz naturel, et tous les autres conforts dont vous avez besoin pour une escapade agréable. Grande Nicklaus parcours de golf conçu dans le quartier avec des centaines d'autres cours à proximité. 45 minutes de l'aéroport Sky Harbor. 15 minutes de la piste de course de Phoenix NASCAR. 15 minutes des Indiens et Reds printemps parcs de formation. Des dizaines d'autres installations de l'équipe à proximité. We had a great time in this rental home. It has everything you need and is well kept. When my husband and I walked in the front door we were both in awe of the openness and light colors In The dinning area which makes the home inviting from the very beginning.. I used the office area daily for my morning exercise routine and the double doors made it especially private. My husband also used the office for a few online meetings. The kitchen is stocked above and beyond the norm. Rich was a joy to work with. My husband and I throughly enjoyed our talks with him and felt very at ease. Any questions or concerns we had Rich was on top of it ASAP. We enjoyed the patio and pool area for a little rest and relaxation. We also took advantage of the golf clubs Rich provided for our enjoyment. The beds are extremely comfortable and tv’s were provided in each bedroom along with an amazing sound system in the family room. Thank you Rich for a great month. We look forward to visiting again. We stayed in this home for 3 months while our house was finished being built. It was a perfect house for myself, my husband, our 2 year old and 2 yorkies. The owner was helpful and quick to respond to any questions. The neighbors were friendly and the neighborhood was nice and quiet. The pool was awesome and we were able to use the community pool/rec center which my son loved. 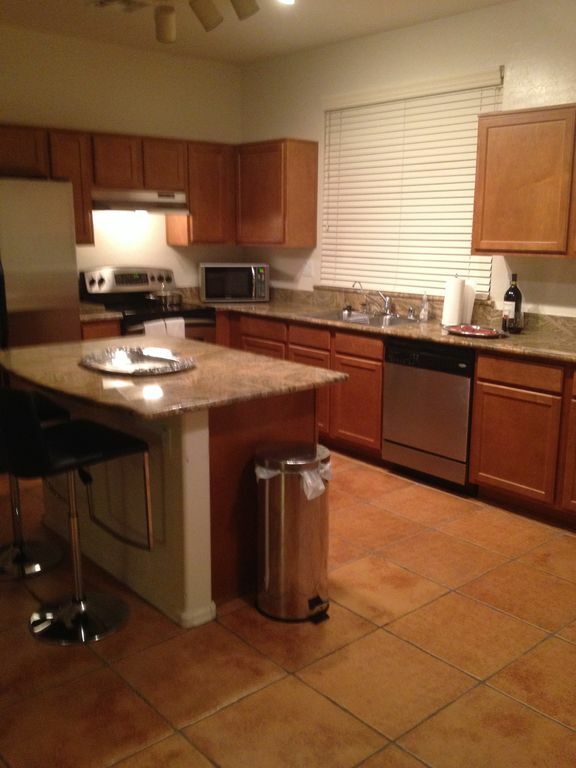 I highly recommend this property for anyone looking for a place to stay on the west side of Phoenix! Belle communauté avec des miles de sentiers, des parcs, des terrains de jeux et des lacs encadrés par les montagnes pittoresques de la Sierra Estrella et inspirant désert sauvage de Sonora. Nicklaus parcours de golf conçu, NASCAR, et la formation de printemps baseball est à quelques minutes. 45 minutes de l'aéroport. Monthly rates are based on a 30 night stay. Cleaning fee is $150. $500 refundable damage deposit.